THETA Poker has been praised by 148Apps as the “best Texas Hold’em game available for the iPhone OS, hands down” and by Pocket Gamer UK as taking “computerised poker to new levels of artificial intelligence”. Rob Walch of the “Today in iOS” podcast praised the app by saying, “If you’re a serious poker player or if you’re thinking about playing poker in home games or you’re just losing your money and want to get a little bit better and need some practice without losing your money, THETA Poker’s nice… gameplay, two thumbs up”. 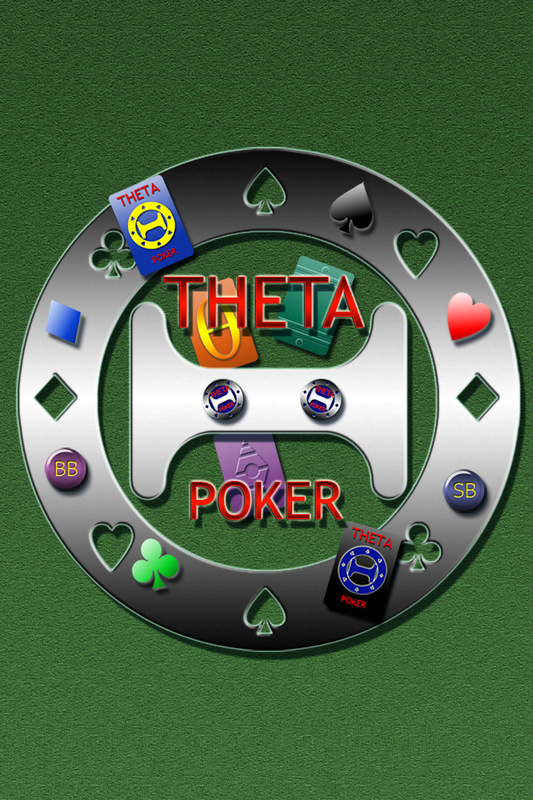 Now, three years in the making, THETA Poker Pro – Texas Hold ‘Em, the worthy sequel to THETA Poker has at last arrived with hundreds of improvements, including a challenging and addicting career mode, stronger opponents, pre-folding to speed play up even more, heads-up displays and other new stats, and more configurable options! If you’ve ever dreamed of playing in the World Series of Poker Main Event, now you can build up your virtual bankroll from nothing to a $10,000 buy-in to the THETA Poker Pro 10,000-Player World Championship! THETA Poker Pro is the strongest, fastest, and most configurable iOS Texas Hold ‘Em game, designed to improve your game while providing endless hours of fun. Play where you want, when you want, and how you want. No waiting. Human-Like AI: Play against the strongest and most realistic artificial intelligence players on any cell phone or tablet. Incredible Tournament Details: Muck your cards to fold; shove all your chips to the middle to go all-in; view complete blind and payout schedules; experience table balancing, chipping up, dead buttons, tighter bubble play, and more. Convenient Twitter, Facebook, and Email Integration: Share pictures or text of your favorite hand or your worst bad beat with a swipe and a few taps. Clean, iOS-Optimized User Interface: Simple and obvious taps and swipes for all actions with an efficient and unique betting mechanism. Portrait or Landscape. Optimized for one-handed operation on all but the full-size iPad. Full Sound and Music Control: Experience real gaming sounds while listening to your favorite local music (including sort-by-album and other special features) or streaming audio like Pandora, Spotify, Shoutcast, and Songza. Complete Hand History: View or email any hand recap from the current event; optional Rabbit Hunting to show what might have been. Send yourself an entire tournament to analyze on your Mac or PC. Advanced Heads Up Display: Tap on any opponent to see their HUD statistics (How tight are they playing? Should you respect their early-position three-bet?). View your own HUD data to improve your play and see how your opponents might perceive you. Extensive Statistics: See how you’re doing in the current event, the current career level, or overall for a given career difficulty or custom mode. Flexible Configuration: Choose the event type (Freezeout Tournaments, Shootouts, or Ring Games), table size, tournament size, play speed (up to 1,000 hands per hour! ), and much more. Total VoiceOver Accessibility: Play without even looking at the screen as all actions are announced out loud. THETA Poker Pro is the first and only fully VoiceOver accessible Texas Hold ‘Em app! 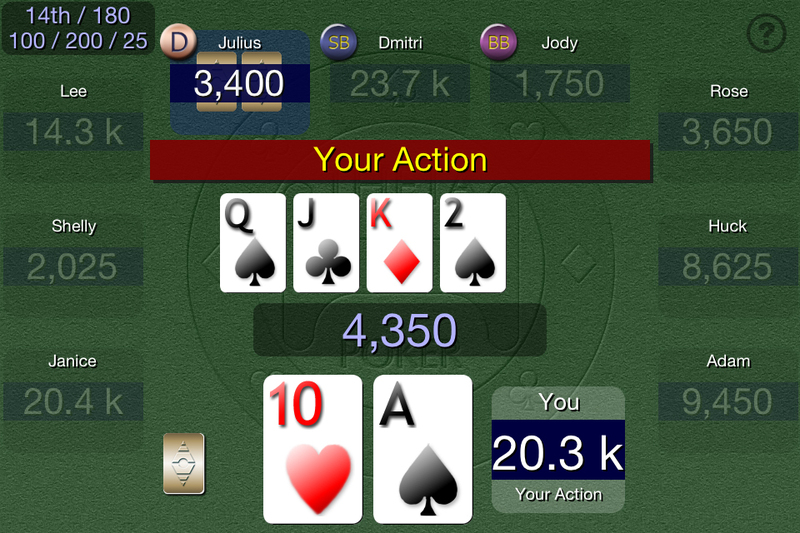 THETA Poker Pro is a universal app that runs on all devices running iOS 5 through iOS 9. The graphics and layout are tailored for each device, including iPhone 6/6s and 6 Plus/6s Plus. Wednesday, August 8, 2018: Apple has removed THETA Poker Pro and all poker games published by individual developers from the App Store. I have filed an appeal but am not hopeful. Thank you for playing my game, which should continue to work for you until Apple makes some incompatible changes (don’t delete it from your device though unless you have it backed up to a Mac or PC and know how to get it back). Friday, November 10, 2017: Version 1.9.2 has been approved by Apple and should be available for download shortly. Friday, November 10, 2017: Version 1.9.2 submitted to Apple. This release fixes a crash when trying to set the hand recap Default Mail Address on some devices (iOS 10). Thursday, November 2, 2017: Version 1.9.1 has been approved by Apple and should be available for download shortly. Wednesday, November 1, 2017: Version 1.9.1 submitted to Apple. This release adds iPhone X support (beautiful in full screen) and an option to show the Status Bar (plus full iOS 11 compatibility and some minor bug fixes). Thursday, June 15, 2017: THETA Poker Pro trivia is now available on the Amazon Echo. See THETA Poker Facts or THETA Poker Facts Help. These facts are culled from the Trivia section of THETA Poker Pro. Tuesday, January 17, 2017: THETA Poker (non-Pro version) is no longer available in the App Store. It will continue to work if you’ve already purchased it but please consider upgrading to a newer device that can run THETA Poker Pro ;-). Monday, December 12, 2016: THETA Poker (non-Pro version) will be removed from the App Store by Apple in the next 30 days. It will continue to run indefinitely, but you will not be able to purchase it anymore. Apologies to those of you on older devices running iOS 7 and older. Saturday, December 3, 2016: Version 1.9.0 has been approved by Apple (after a delay on this end) and should be available for download shortly. Tuesday, November 22, 2016: Version 1.9.0 submitted to Apple. NOTE: version 1.8.5 is the last release that is officially compatible with iOS 6 and iOS 7 (please download it from the App Store to those devices while it’s still available for the next week). Version 1.9.0 supports iOS 8 and higher only, fixing rotation issues and stack overflow crashes on iOS 10. For more details see release notes. Thursday, April 28, 2016: Version 1.8.5 has been approved by Apple and should be available for download shortly. Wednesday, April 20, 2016: Version 1.8.5 submitted to Apple. This release fixes the bug introduced in the 1.8.4 that made the pot disappear for everyone. Tuesday, April 19, 2016: Version 1.8.4 has been approved by Apple and should be available for download shortly. Thursday, April 14, 2016: Version 1.8.4 submitted to Apple. This release hopefully fixes a hanging problem in the iOS version and includes minor AI improvements regarding folding to very small raises in all-in situations. Thursday, January 14, 2016: Version 1.8.3 (iOS) has been approved by Apple and should be available for download shortly. Saturday, January 9, 2016: Version 1.8.3 (iOS) submitted to Apple. This release fixes an iPad alert crash introduced in Version 1.8.2 (various confirmation pop-ups on the poker table). Friday, January 8, 2016: Version 1.8.2 (iOS) has been approved by Apple and should be available for download shortly. Friday, December 18, 2015: Version 1.8.2 submitted to Apple. This release catches the iOS version of THETA Poker Pro up with the tvOS version, adding Quick Tips (Help menu) and Bonus Features (Options menu). Both iOS and tvOS versions also have minor VoiceOver fixes. Friday, December 11, 2015: Version 1.8.1 (tvOS only) has been approved by Apple and should be available for download shortly. Sunday, December 6, 2015: Version 1.8.1 (tvOS only) resubmitted to Apple. VoiceOver is now fully supported! Swipes now produce the system beep, which isn’t currently optional. Sunday, November 15, 2015: Version 1.8.1 (tvOS only) has been approved by Apple but was not released due to VoiceOver and other issues (the new Beep on Swipe option has already been removed). Thursday, November 12, 2015: Version 1.8.1 (tvOS only) submitted to Apple. Beep on Swipe toggle added (Music & Sound menu), Card Design and Table Background options added (Cards and Table menu), and Quick Tips and Bonus Features Archives enabled. Top Shelf may still not be updating (will be fixed in next release if needed). Friday, November 6, 2015: Version 1.8.0 (tvOS only) has been approved by Apple and should be available for download shortly! THETA Poker Pro is a universal purchase, so if you bought it for iOS, you should already see it in the Purchased tab on your Apple TV. Enjoy! Monday, October 26, 2015: Version 1.8.0 (tvOS only) submitted to Apple; initial release for Apple TV (fourth generation). Resubmitted November 2, 2015 and again November 5, 2015 (argh! Problems with Top Shelf images). Saturday, September 19, 2015: Version 1.7.9 has been approved by Apple and should be available for download shortly. Saturday, September 12, 2015: Version 1.7.8 submitted to Apple. Very minor changes to ensure the app runs great on iOS 9. Thursday, August 27, 2015: Version 1.7.7 has been approved by Apple and should be available for download shortly. Thursday, August 20, 2015: Version 1.7.7 submitted to Apple. Fixes to the User Rank in tournaments. Very minor tweaks to AI where it didn’t realize the board was the nuts and one more place where it was folding to a small subminimum all-in reraise preflop. Friday, July 31, 2015: Version 1.7.6 has been approved by Apple and should be available for download shortly. Friday, July 24, 2015: Version 1.7.6 resubmitted to Apple. Added “… After Board” VoiceOver menu option that announces your hole cards after the community cards when you tap on the latter. Wednesday, July 22, 2015: Version 1.7.6 submitted to Apple. 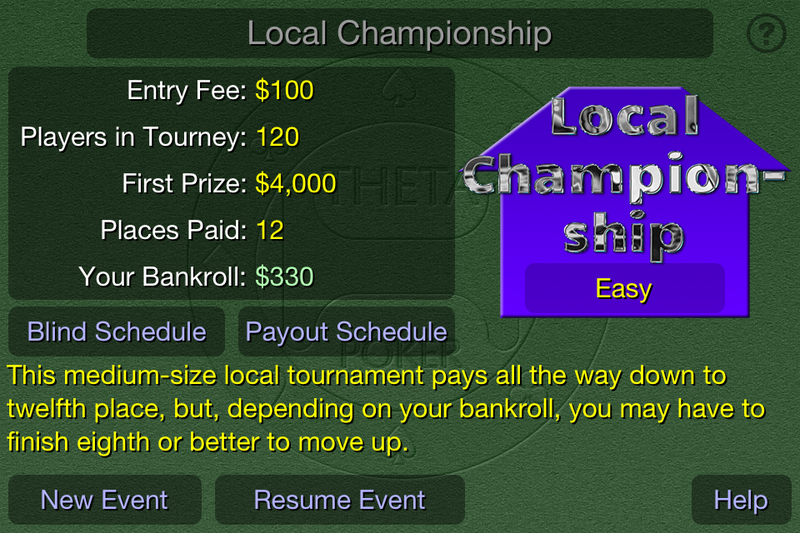 VoiceOver enhancements: tapping on the middle of the table now announces your hole cards and the community cards. Wednesday, July 22, 2015: Version 1.7.5 has been approved by Apple and should be available for download shortly. Tuesday, July 14, 2015: Version 1.7.5 submitted to Apple. Fixed problem where bots were sometimes folding to tiny all-in preflop raises. Wednesday, July 1, 2015: Version 1.7.4 has been approved by Apple and should be available for download shortly. Wednesday, June 24, 2015: Version 1.7.4 submitted to Apple. A check sound has been added, and a statistics loophole involving toggling out of practice mode has been closed. Wednesday, June 24, 2015: Version 1.7.3 has been approved by Apple and should be available for download shortly. Monday, June 15, 2015: Version 1.7.3 submitted to Apple. Several minor bug fixes and AI improvements; see release notes. Tuesday, May 12, 2015: Version 1.7.2 has been approved by Apple and should be available for download shortly. Monday, May 4, 2015: Version 1.7.2 submitted to Apple. This adds a “Doubling Blinds” option to the “Blind Increases” menu and fixes some crashing problems on iPads running iOS 8. Monday, April 20, 2015: Version 1.7.1 has been approved by Apple and should be available for download shortly. Friday, April 10, 2015: Version 1.7.1 submitted to Apple. This fixes the missing chip on some devices if “Settings->Graphics->Large Numbers” is turned off and also corrects some minor problems with the Graphics menu introduced in Version 1.7.0. Thursday, April 9, 2015: Version 1.7.0 has been approved by Apple and should be available for download shortly. Tuesday, March 31, 2015: Version 1.7.0 submitted to Apple. This fixes a crashing problem on iPads running iOS 7.x. Many enhancements and other bug fixes can be found in the release notes. Thursday, February 12, 2015: Version 1.6.2 has been approved by Apple and should be available for download shortly. Wednesday, February 4, 2015: Version 1.6.2 submitted to Apple. Under iOS 8+, THETA Poker Pro now asks for “Notifications” permission to badge the app with Latest News count. Also refixed “Custom Thousands Separator” on non-U.S. devices. Wednesday, January 28, 2015: Version 1.6.2 has been approved by Apple and should be available for download shortly. 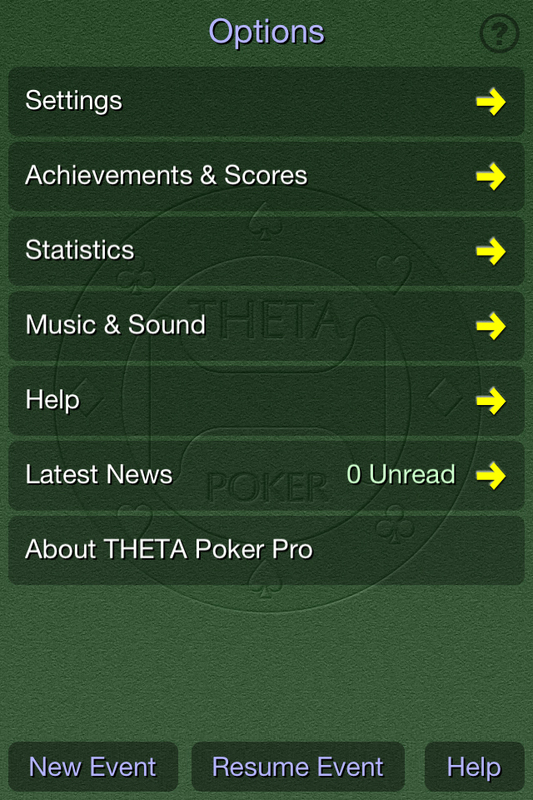 Tuesday, January 27, 2015: “THETA Poker Pro app review: learn how to play poker like a pro” posted by AppReview. Thanks! Thursday, January 22, 2015: Version 1.6.2 submitted to Apple. This fixes a big mistake in heads-up play where Advanced and stronger computer players were calling big all-in shoves with any two cards. The same error would cause players at full tables to underestimate how short stacked they were whenever the betting made more than one loop around the table. Tuesday, December 30, 2014: Version 1.6.1 has been approved by Apple and should be available for download shortly. Yes, that was just one day for approval! Thanks, Apple. Monday, December 29, 2014: Version 1.6.1 has been resubmitted to Apple with the iPhone 6 Plus fixes as waiting for the previous version to be approved and then submitting a new version would have taken longer. Tuesday, December 23, 2014: Two fixes for the iPhone 6 Plus will be submitted to iTunes Connect as soon as it returns from its holiday shutdown. Portrait mode is missing its felt (with the THETA Poker embossing), and when the iPhone’s Display Zoom mode is turned on, neither orientation displays properly (shrunk a bit to the upper left of the screen). Expect version 1.6.2 before mid-January. Sunday, December 21, 2014: Version 1.6.1 submitted to Apple. If you updated your iPad to THETA Poker Pro Version 1.6.0 and are crashing at the end of tournaments and other action sheets, please see the THETA Poker Pro To Do list for a temporary fix until this version is approved by Apple (early January because of the holiday break). Sorry! Friday, December 19, 2014: Version 1.6.0 has been approved by Apple and should be available for download shortly. Saturday, December 6, 2014: Version 1.6.0 submitted to Apple. Major release includes better support for iOS 8, iPhone 6, iPhone 6 Plus, and a new VoiceOver (Accessibility) menu. See the release notes for details. Tuesday, September 16, 2014: Version 1.5.2 has been approved by Apple and should be available for download shortly. Monday, September 8, 2014: Version 1.5.2 submitted to Apple. Fixed several small problems. See the release notes for details. Tuesday, July 29, 2014: THETA Poker Pro shoutout in the Today in iOS podcast (item 0315) [from 3:43 to 5:21]. Listen in if you want to try to win a free copy of the app. Tuesday, July 29, 2014: Version 1.5.1 has been approved by Apple and should be available for download shortly. 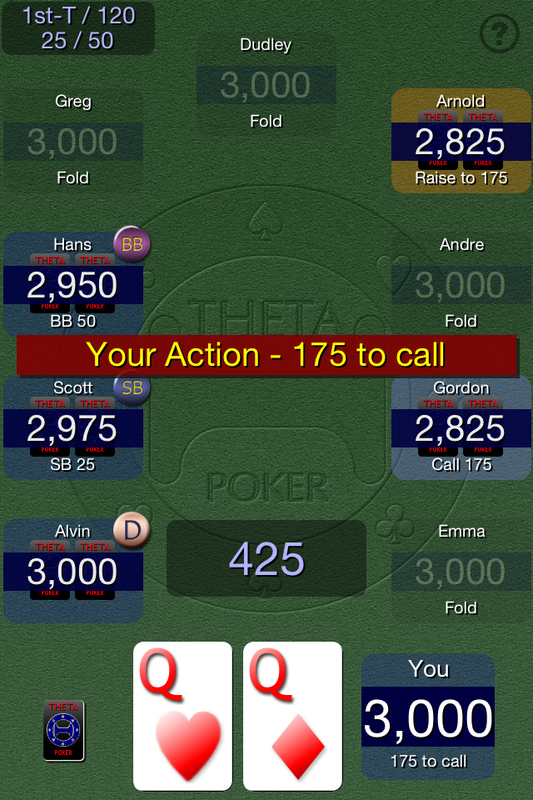 Monday, July 28, 2014: AppPicker named THETA Poker Pro one of The best Texas holdem apps for iPhone. Friday, July 25, 2014: Version 1.5.1 submitted to Apple. Fixed a couple of minor menu problems that only occurred after the app had been removed from memory. Monday, July 14, 2014: Version 1.5.0 has been approved by Apple and should be available for download shortly. Wednesday, July 9, 2014: Version 1.5.0 submitted to Apple. New Practice Menu (Practice Mode [moved from Settings menu], Hide User Hole Cards, Rabbit Hunting submenu, and Show All Hole Cards submenu). See the release notes for details. Monday, July 7, 2014: Version 1.4.2 has been approved by Apple and should be available for download shortly. Tuesday, July 1, 2014: Sorry, slight delay as Version 1.4.2 was resubmitted to Apple to fix a bug that it introduced. Friday, June 27, 2014: Version 1.4.2 submitted to Apple. Two minor tweaks: longer VoiceOver message when you bet or raise and removed a message “showing” your cards in certain all-in situations. Thursday, June 26, 2014: Version 1.4.1 has been approved by Apple and should be available for download shortly. Friday, June 20, 2014: Version 1.4.1 submitted to Apple. Bug fixes, better number formatting for international users, new “Return Extra Chips” option, and small VoiceOver changes. See the release notes for details. Wednesday, June 11, 2014: Version 1.4.0 has been approved by Apple and should be available for download shortly. Thursday, June 5, 2014: Version 1.4.0 submitted to Apple. Numerous VoiceOver changes, including special gestures for folding, checking/calling, and betting/raising! See the release notes for details. Monday, May 19, 2014: Version 1.3.1 has been approved by Apple and should be available for download shortly. Tuesday, May 13, 2014: Version 1.3.1 submitted to Apple. Showdown hand strengths now include more detail as needed to distinguish the winning hand. Default settings are now customized for VoiceOver users the first time the app is run. See the release notes for details. Monday, May 12, 2014: Version 1.3.0 has been approved by Apple and should be available for download shortly. Wednesday, May 7, 2014: Mario Lang posted a terrific written review of THETA Poker Pro from an Accessibility angle. Thanks! Monday, May 5, 2014: Version 1.3.0 submitted to Apple. VoiceOver enhancements, including three-finger swipes to move between screens and two-finger scrubs (‘Z’) to go back to the previous menu or dismiss pop-ups. See the release notes for details. Wednesday, April 30, 2014: dave728nc posted a 5-Star audio review, with special emphasis on the VoiceOver capabilities of THETA Poker Pro. Thanks! Wednesday, March 19, 2014: Version 1.2.3 has been approved by Apple and should be available for download shortly. Wednesday, March 5, 2014: Version 1.2.3 submitted to Apple. Fixed a couple of minor but annoying missing large messages (after “No raise allowed” alerts and the hand winner message under some very specific circumstances). Thursday, January 30, 2014: Version 1.2.2 has been approved by Apple and should be available for download shortly. Thursday, January 23, 2014: Version 1.2.2 submitted to Apple. Added Table/Event toggle and email capability to User HUD. Monday, September 23, 2013: Version 1.2.1 has been approved by Apple and should be available for download shortly. Friday, September 20, 2013: Version 1.2.1 submitted to Apple. Voice Announcements option added (Music & Sound menu) for iOS 7 only. Wednesday, September 18, 2013: Version 1.2.0 has been approved by Apple and should be available for download shortly. Welcome to iOS 7! Friday, September 13, 2013: Version 1.2.0 submitted to Apple. Upgraded for iOS 7. Friday, August 30, 2013: Version 1.1.2 has been approved by Apple and should be available for download shortly. Friday, August 23, 2013: Version 1.1.2 submitted to Apple. Minor changes are detailed in the release notes. Friday, July 19, 2013: Version 1.1.1 has been approved by Apple and should be available for download shortly. Tuesday, July 9, 2013: Version 1.1.1 submitted to Apple. Several minor bug fixes and tweaks. Friday, June 7, 2013: Version 1.1.0 has been approved by Apple and should be available for download shortly. Monday, May 31, 2013: Version 1.1.0 submitted to Apple. New features (swap your chips and the deck, turn off just the shuffle sound, and more) plus a few bug fixes detailed in the release notes. Sunday, March 10, 2013: Version 1.0.2 is now live! Monday, February 25, 2013: Version 1.0.2 submitted to Apple. Many small fixes, detailed in the release notes. Friday, February 1, 2013: THETA Poker Pro – Texas Hold ‘Em is now available in the App Store. Many thanks all to the tremendous beta testers, some of whom have played hundreds of thousands, if not millions, of hands over the last three years! All of your great ideas are most appreciated, even if some of them haven’t made it into this initial release.